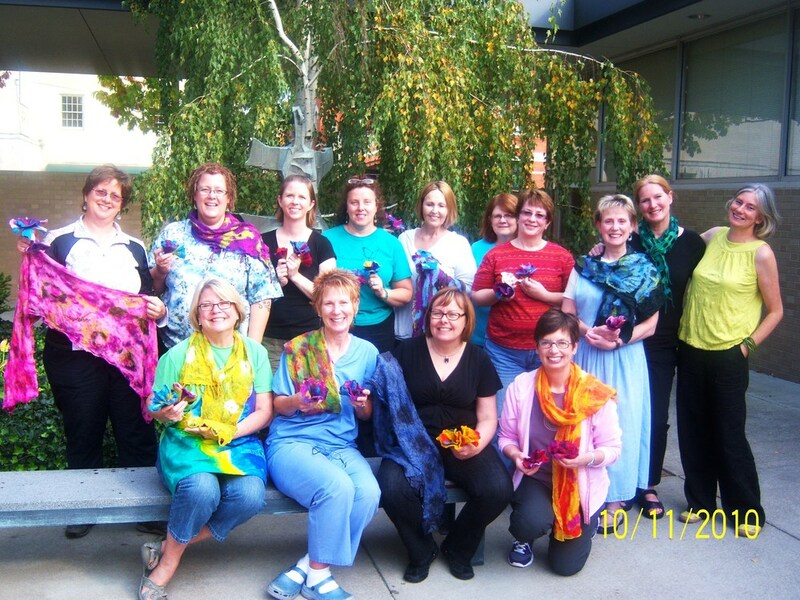 NICOLA BROWN OF IRELAND COMING TO PLAINWELL, MICHIGAN FOR FELTMAKING WORKSHOPS! I am pleased to announce that Nicola Brown is making a return trip to Plainwell, Michigan next month. We had wonderful workshops here last Fall and I know that the below workshops will be just as informative, fun, and a wonderful learning opportunity for all. Nicola is a member of the Crafts Council of Ireland, Feltmakers Ireland, the International Feltmakers Association, the Nine Stones Artists and the South East Textile Group. Skill Level: Basic felting skills an advantage. Simple and striking, decorative and practical, this one day workshop will help participants design and create their own unique and beautiful vessel, purse, iPad cover or other simple three dimensional object. Working with plastic resists learn how to incorporate different layers into three dimensional work, these will be opened up near the end of the felting process to expose different colours, fabrics, found objects or inclusions . Some participants may choose to create purely decorative art pieces while others may want to felt purses with integrated handles, iPad covers or other functional items, the complexity of the design will reflect the previous experience of each individual felter. Participants are encouraged to bring along treasured bits and bobs from their stash, buttons, beads, scraps of vintage fabric, shells, stones, glass nuggets etc., these all make wonderful inclusions in felt and help to personalize and create a truly unique work of art! Nicola will bring a selection of unusual fabrics with her from Ireland including metallic meshes and sequin or glitter studded polyester, participants will be free to use these as accent areas in their work. Nicola will also bring some samples of the Irish mohair waste fiber that she is currently experimenting with in some of her own two and three dimensional work. Class price: $140 ($130 per day if both workshops are taken) Please email Dawn Edwards to book your place! Participants taking both workshops have the option of designing and felting larger and more complex vessels, bags, sculptural items, slippers or indeed an art piece for the wall. These would be completed over the two day period and could include a variety of more difficult shapes, inclusions, flaps, pockets, handles, closures etc., a two day workshop is the best option if you have ideas in mind for a technical, challenging yet fun project! Discover the possibilities of creating your own unique fabric for clothing using the mosaic nuno technique. Participants in this workshop will leave with a beautiful nuno mosaic scarf or if preferred an unusual panel perfect for inclusion in any one off piece of clothing. A minimum of 1m silk chiffon in total per person will be required comprised of at least 3 different colours  clashing and contrasting colours work brilliantly as do printed silks combined with plain. Some of the most beautiful nuno mosaic includes large and small pieces of vintage silk scarves or sari fabrics, please bring these along if you have any in your material stash! NB If anyone prefers not to work with silk a lightweight cotton muslin or gauze may be substituted and although this will not create such a soft piece of felt it is perfect for skirts etc. This entry was posted on April 11, 2011 at 4:13 am and is filed under Uncategorized. You can follow any responses to this entry through the RSS 2.0 feed. You can leave a response, or trackback from your own site.